The world lost Rick Rypien on Monday night. There's not much else that really can be said that hasn't been said already about the young man's life being taken so young. There were a decent amount of demons in his life that he tried to overcome and to some, it seemed that he may have been able to curb his moods; especially with his signing in Winnipeg this summer. This is where I go full disclosure on this. I am a sufferer of depression. It's not something I like to put out there too much, but as I look back on what has come out on Rypien from those close to him; I see a lot of things that I could relate to or that may have some personality traits that have been put out there. It may seem like I'm trying to put myself over in this tragic time (not the case at all), part of me wants to give a different angle and maybe put forth some idea to people who may not be familiar with some things and just different stuff that's being said about Rypien and the person he was. This will probably seem all over the place, so I apologize in advance. Also, this is all from my personal experiences in one way or another. Others will probably say differently, which is another great thing to have-- options are always a good thing. "I’ve got a clean mind, and, I’m healthy, I’m happier with myself than I’ve ever been. I think it’s going to be how I behave and how I act over time, but I’m just taking it one day at a time, and I’m more excited about hockey than I’ve ever been in my whole life." 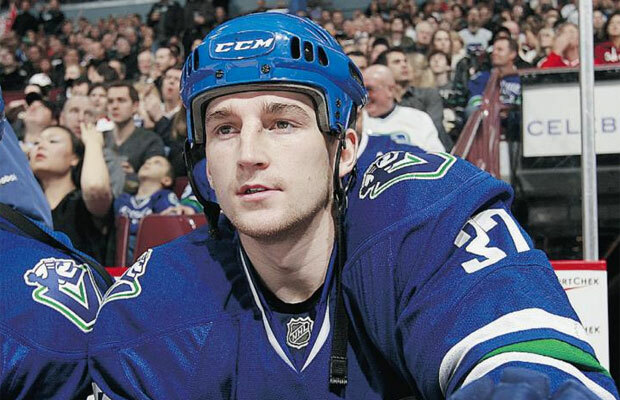 ~ Rick Rypien; March 8th, 2011. While we don't know if Rypien actually did commit suicide or not to this point, it's still odd that the RCMP would say it was a "sudden and non-suspicious" death. If it was suicide, that just shows how quickly depression can change things. Five months is a long time, but who knows how many times he had bounced back and forth from mood to mood. That's just it with depression-- it's never expected, one way or another. You could be at the highest highs, but the next minute; you're down in the dregs again within seconds, minutes, days, weeks, and so on. It's a dreaded thing and you never really know what's happening until it's too late. The root of depression is something that is also unknown, though while he was playing junior hockey in Regina, his girlfriend at the time was killed in a car accident on the way to seeing him play. Odds are, something like that is going to eat away at a teenager and be hard to deal with. With a trigger like that, it may not take much for anyone to slip back into a back thought process that isn't the brightest. When it comes to group situations, some who are depressed are going to be very on-guard when dealing with it. They don't really want to be vulnerable to people they may not know. Even those who they do know, they don't like to put themselves out there at first. That said, like Glass mentioned, when you get a solid group there and the mood is light; it's easy for people to have their mood change and actually start enjoying things more and more and get involved into the discussion and involved into the conversation or whatever social activity there happens to be. It's a matter of gaining trust and a matter of having the mindset that things will be okay if you put yourself into the whole spirit of the things going on around you. Sure, some events may be harder than others; but that can go with anyone in a new or unfamiliar situation. That's where the hook is when it comes to those who are depressed. There's some out there who do like to air out their problems, but for some-- they'd rather not broadcast it out to anyone, even trained professional. Why that is?? Talking from a personal stand-point, it could seem as a bother. People do want to help and people do want to be able to listen-- but at the same time, a person in that state of mind will not see it like that may think they would be judge differently and have people act different around them-- something that no one wants to have happen to them. The whole bothered feeling may go with the whole ideal that everyone has problem and the mindset that you really don't matter and who's to say your problems are bigger or more of a concern than the person you're trying to talk to. When you have that down feeling and possible feeling of hopelessness; you're not going to be as open as you would like to be or as people would want you to be. A lot of people have offered either places to call or go to in order to get help or have offered an ear for support. It is a very kind gesture and really selfless, but there's a lot of people out there who are depressed who won't take them up on those suggestions or offer because of not wanting the feeling of being vulnerable or bothersome. It all goes back to moods changing in an instance from one thing or another. It's something that can change on a dime and even though the outlook you have is sunny and help you've gotten gave you a nice foundation to build off of....sometimes, it's just not enough. And that's the sad part of it all. Rypien did all he could to help himself. The Canucks, the NHL-- they did all they could in order to not just get Rypien back on the ice; but mostly to get him back on track for his own life rather than his own career. It's been quite the tough nine-months when it comes to death of those in the hockey community in their playing career-- Rypien, Derek Boogaard, Sharks' prospect Tom Cavanagh, and Daron Richardson, daughter of former player Luke Richardson, all passing long before they should have. You can debate whether fighting or physicality of the game is the cause for player's mentality change or what-have-you, but at the same time you can't dismiss the possible preexisting conditions that may have loomed before hand. Something where hockey or physicality wasn't involved. Sometimes depression or mental illness is something that can't be detected as readily as other illness. The best thing to do is to see someone qualified to talk to. There are plenty of places to turn to online-- TWLOHA is one that I'm a big supporter of. You have the Depression and Bi-Polar Alliance and the National Suicide Prevention Hotline in the US and the Canadian Association for Suicide Prevention. In Ottawa, the Do It For Daron Foundation is one that has been putting themselves out there to the youth of the region to talk about their problems in the wake of Richardson's passing. There's times where's it hard to admit you need help or admit that you have mental issues because there's people who do have preconceived motions of how people act and how they should be treated. But it's okay to look for help and it's okay to talk to people if they're willing to listen to you without judgement. People are there for you even when you think no one is. Reach out to them. Keep the discussion going because there's a lot more people out there who are dealing with the same problems as you. Bett and Bals: "Shroud of Mystery"
Is the Buffaslug is the New Fisherman?? The "O" Stands For "Oh Em Gee"